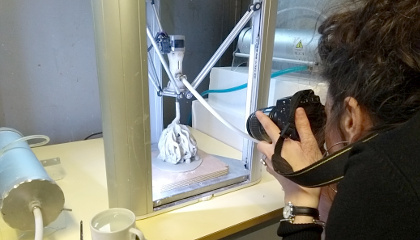 Wishing to ring the changes with the module I offer at Ecole Nationale Supérieure d'Art in Limoges I introduced the students of Le laboratoire de recherche to the photogrammetric software Agisoft, a PhotoScan program. This proved to offer an interesting dynamic where the emphasis was no longer on the 3D modeling software or the ceramic printers but on concepts of 3D cut and paste, of transformation and copy and print. Students learned what bit of the 3D modeling program they needed to clean up the scans while different questions were asked of the ceramic printers. Students became interested in the results and the technicalities just became part of the process. A good thing about teaching is being stretched by students as was the case by a jewelry student wanting to print small scale items. I was most surprised how well the WASP ceramic printer coped with what we we threw at it. Invited by curator and art historan Wendy Gers to be on a pannel she was chairing at Clay Matters I could not say no especialy on seeing it would be a chance to catch up agin with fellow artists Shlomit Bauman (IL) and Linda Sormin (CA – USA), who also presented papers. 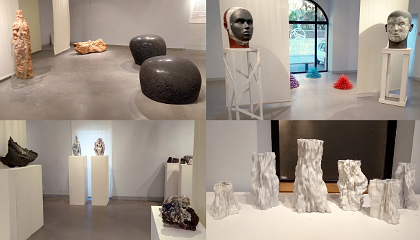 Organised by the Department of Ceramics/ Fine Arts at Hasselt University, Clay Matters consisted of a symposium and exhibition aimed at reviewing the common ground between ceramics and contemporary art, the relationship between ceramicists and other visual artists, as well as the role and relevance of clay in art today. 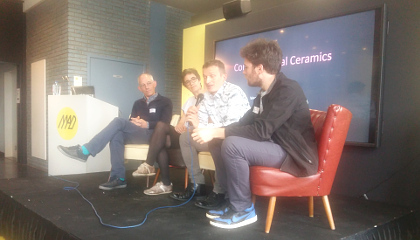 Our panel consisted of me, Wendy Gers (SA – FR) Adam Abel (PL) and Christopher Kelsall (FR) and unsurprising the title was ‘Computational ceramics’. Each of us did a short presentation of our own work and then took questions from the floor and discussion followed from there. It was really interesting to get to know the work of Adam Abel, while Christopher Kelsall I already knew from Limoges. This is the second time I have been invited to teach at the Design School in Reykjavik and you cannot but be enchanted by the place and struck by the extraordinary landscape. My brief in this module is to introduce the concepts of computer 3D drawing and modelling and to explore the basics of ceramic 3D printing. After a recap of the mathematical principals of defining points in space with x, y and z coordinates we move onto using the open source free to use Blender 3D modelling software. This presents a steep learning curve but I am of the opinion that if you put in the hours you will be well rewarded. As computer aided tools become the norm in the modern world of art and design it is just part of the skill set you have to know. I’m not for one minute saying this must take priority over traditional ways of working, these are add-ons and the future is about combining new and old ways of working – use the right tool for the right job. This is a 10 minute film made during the week long workshop and symposium on ceramic 3D printing held in Tallin during August. I have writen about this project in this journal below. 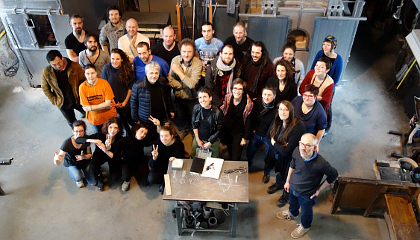 Held at the Centre Ceramique Giroussens in the South of France and organised by Terre et Terre, an artist led group La Sculpture Ceramique was a workshop program, conference and exhibition on the theme of ceramic sculpture. The week program started with three day workshops then a three day conference with the exhibition that ran until December, opening on the first evening of the conference. 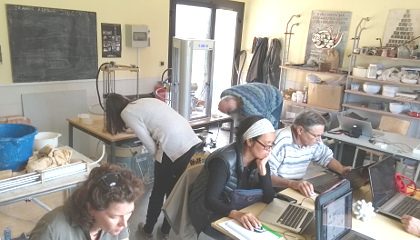 I led a ceramic 3D print workshop at the ceramic centre and three other French ceramic artists led workshops in nearby studios – Jean Fontaine, Anne Verdier and Jacques Kaufmann. We all then presented artists talks in the conference along with the other artists also included in the main exhibition, who were Claudi Casanovas (Cat – Esp), Daphne Corregan (Fr), Bean Finneran (USA) and Chris Whight (UK). 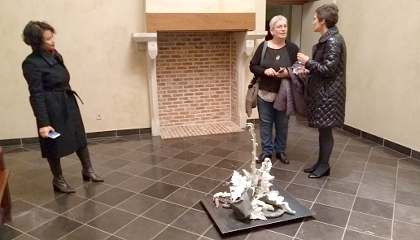 Curator Stephanie le Follic-Hadida (Fr) and the director of the Ariana Museum, Geneva Isabelle Naef Galuba (CH) offered a perspective on ceramic sculpture from their professional points of view. A refreshing perspective to this whole event was that it was planned and curated by fellow artists. Firstly credit to the amount of work that goes into organising an event like this but then also we were getting the view point of artists and not arts administrators – we need administrators and people to run and further the arts, curators and promoters but too often I fear they set their own agendas that differ from those of working artists. The spiralling absurdity of the art market is a good example of this where it no longer bears any relationship to creative artistic endeavour in the studio. This was the second project meeting in the current phase of the Erasmus+ 3D Education project. On being shown around the school with teachers from the other six participating schools I was encouraged to hear that the school uses the Linux operating system throughout and further the female ICT class teacher made the point that she actively encourages female students in computation and technology. 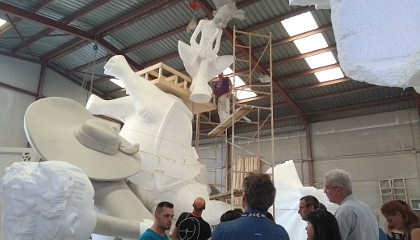 Amongst the many activities organised was a visit to a Fallero Workshop where Falla are produced using scanning, CNC cutting and layered sculpting. These amazing constructions are for an annual street procession and festival where the Falla are then burned. Eileen Blackmore, a fellow design advisor to the project like myself, led a most successful workshop based around a design production methodology developed by Dutch researcher Sarah Sui. In brief it is a framework that looks at the layers of design thinking: communication, process and expression – sensorial, behavioural, functional, physical and mental layers. Co-funded through the Creative Europe program and part of a much wider project called Ceramics and Its Dimensions this touring exhibition moved onto its fourth venue, the British Ceramic Biennial, Stoke-on-Trent. Having been involved in the previous two biennials (See journal for Sept 2015 and Sept 2013) I was away for most of this so did not get to see the exhibition but was reassured that with so much work on show in Stoke my work did register on social media – or is it that you can find anything on the internet if you look hard enough. 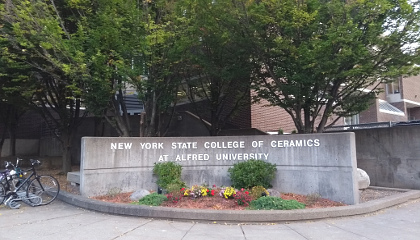 I was fortunate to be invited for a visit to Alfred Ceramics in rural NY State. It’s not surprising this course comes out top in USA league tables as it is just concentrated high standards – from personnel to students to facilities. It is known for its facilities but I place that third in line as it is the people who make the place. 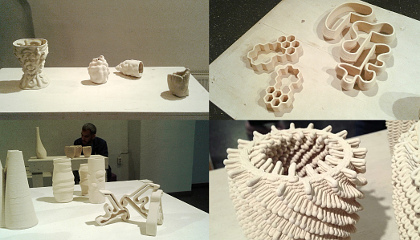 Of particular interest to me was the link between the ceramic art school and the ceramic engineering department. I was surprised how little digital equipment there was in the art school clay studios but the engineers more than made up for it. While there are strong links between these two schools I was also sorry not to see more use of computational ways of working over in clay, particularly within MA students. Elsewhere in the art school there were equally dynamic departments such as in computer coding for artists and designers but I did not get a sense of clay venturing into these areas. 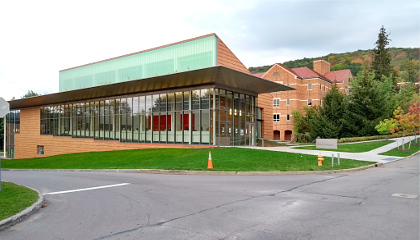 The Alfred Ceramic Art Museum over the road from the clay department is a teaching and learning resource that just reinforces the opportunities on offer at this University. 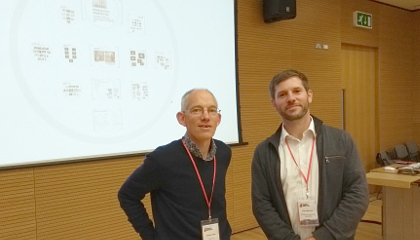 This international conference looked at evolving digitally engaged teaching and learning in art and design for Higher Education. 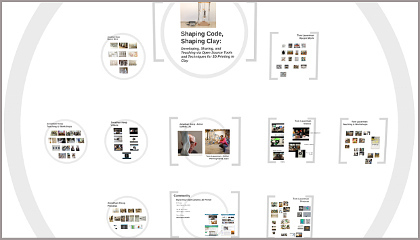 Themed ‘Teaching Making/Making Teaching’ Tom Lauerman of PennState College of Arts in the USA and I did a joint presentation entitled ‘Shaping Code, Shaping Clay: Developing, Sharing, and Teaching via Open Source Tools and Techniques for 3D Printing in Clay’. Tom has been very active in promoting the use of clay in 3D printing and has also developed an open source 3D printer and of a different style. For our presentation we did not follow the standard liner narrative, rather having information laid out on a Prezi presentation we could then improvise a conversation between ourselves. 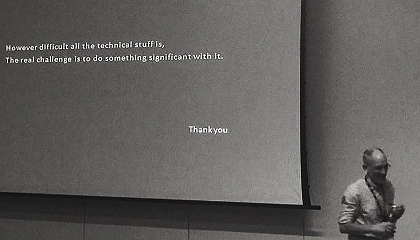 It worked well and wanting to focusing on self-empowerment and the desire to explore technology in a leading rather than a following way we could include questions from the floor into the talk. 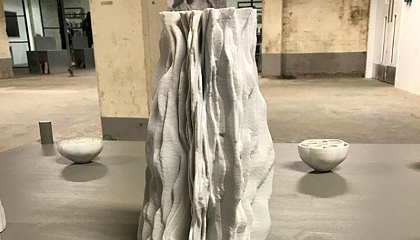 For two years the department of ceramics at the Estonian Academy of Arts, Tallinn has been developing 3D printing and including the technique in their curriculum. Head of department Urmas Puhkan is skilfully supported by Lauri Kilusk who looks after the ceramic printing and they are in the fortunate position of having a young engineer Madis Kaasik who is developing equipment for them. 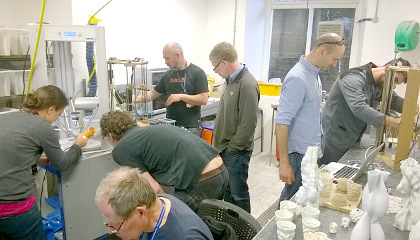 Last August they organised a 3D clay printing workshop at EAA for ceramists from Estonian, Finnish, Lithuanian, Latvian, Norwegian and Russian universities, shareing experience and encouraged participation. The event was organised again this year and I was lucky to be invited as a guest. This years program was expanded to include students and staff and over ten nationalities were represented. A week is too short for covering all the many aspects to ceramic 3D printing but the organisers did well to cram in as much as possible. Samson Shafran from Shenkar College of Engineering and Design, Tel Aviv presented a very thorough lecturing on 3D printing and then helped with 3D modelling software. 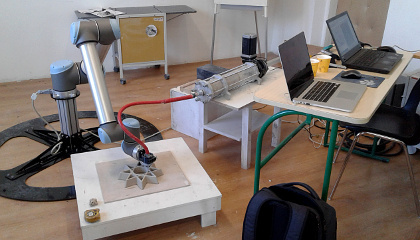 Rasmus Eist who works in the sculpture department of Tartu Art College, Estonia demonstrated and assisted with 3D scanning while also helping with 3D printers. Madis Kaasik brought a number of machines and Lauri Kilusk looked after clay preparation and kept everthing running. The EAA architecture department had just taken delivery of a Universal Robot arm that was borrowed and Lauri got that up and running. De Jutter, Vlieland is the lead school of the Erasmus+ project that I am involved in and is looking at how 3D thinking and 3D printing is being incorporated in schools curriculum across the EU. 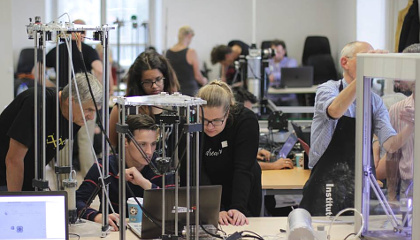 In 2013 the school situated on an island off the northern Netherlands became interested in how 3D printing could help an island community and whether they could recycle plastic washed up around the island to use in 3D printing. What was a Comenius EU funded project was born and is now in its second two year phase as an Erasmus+ project? 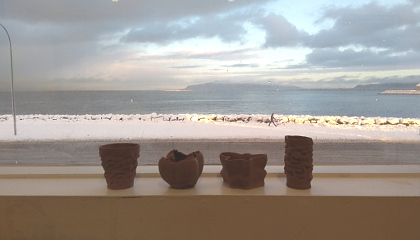 I was invited to do a ceramic 3D print workshop so we themed it around the idea of making ceramic souvenirs for the island. As so often happens we ran out of time but the idea was not only to look at the design of souvenirs but for students to do first hand research in the town of Vlieland to find out what sort of items sell and the price range. 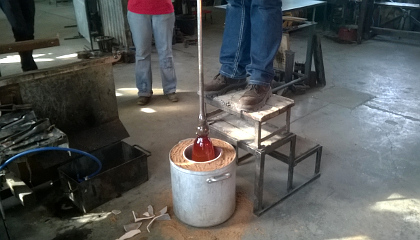 To then develop a business plan around the design, manufacture and distribution of their souvenirs. 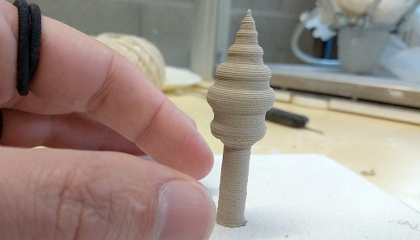 While too ambitious in this instance I do think 3D printing can offer the technology and manufacturing capabilities for a small scale ceramic business of this model. 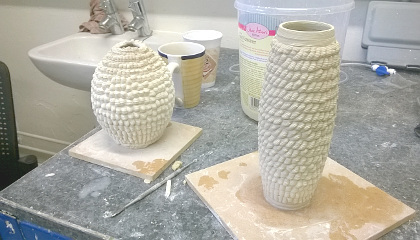 This was a rewarding workshop for me in that most often I am teaching software as well as clay but in this case the staff were up to speed with software. The outcomes are so much better when this is the case and I am always excited to see what others can do with the technology. Staff from the Design & Applied arts departments had almost completed the build of a JK Delta DIY ceramic printer by the time I arrived. So the workshop consisted of getting their printer up and running and then along with two printers I had brought as a group we explored how to print in clay. Discussions were had as to how to introduce this way of working to students, and how it will spinout into research projects. The school is considering building a bigger printer and to experiment with printing in concrete. Thinking like a traditional potter I coded a point in virtual space to spiral and as it grows into the pot shape a three dimensional computer mesh is created linking the points. The surface of the mesh is progressively textured by adding digital sound recording to the growing form. The surface, from base to rim becomes a representation of the rhythm and tone of the sound named in the title of each pot. I am interested to see whether there is any correlation between the physical visual representation of bird song and human music in the patterns on the surface of the vases. We know what the rhythms and pitch of each sounds like but what do they look like? 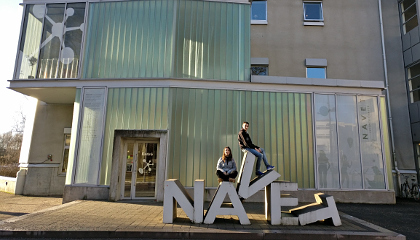 In the Autumn of 2014 the National School of Art, Limoges establish a new research laboratory conducted by artist Michel Paysant (top image). Michel has a really interesting approach to education with the ambition to promote contemporary creative cross over between art and design courses that through research and experimentation combines plastics, theoretical and scientific knowledge around materials. I am delighted to be a visiting lecturer on this course. The laboratory aims to involve ceramics, in its various forms at the very heart of the project while looking for the most unexpected and unpredictable. To establish new relations between ceramics and the surrounding world and to encourage new dialogues between students engaged in artistic practices and the territories of researchers and experimentation. There is a desire to build collaborative projects and promote cooperation that produces outcomes at the borders of these territories. The Lab seeks to question the type, model, and standards set by tradition and thereby creating works that surprises the creator and the viewer. 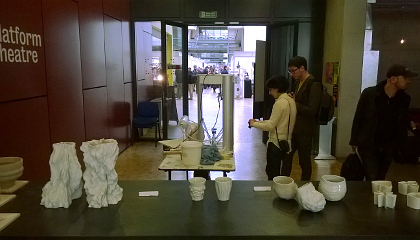 ‘Ceramics as Experience’ was this year’s summer presentation of the laboratory. I exhibited my Refraction series where I am interested in the layers of skin that build the object. Referencing the tradition of pottery, of a clay body covered in glass I have separated out these two elements so now there is space between the outer glass skin and the inner clay body. This gives space for light falling on the body to become refracted offering a surface decoration that is constantly changing according to the light condition. 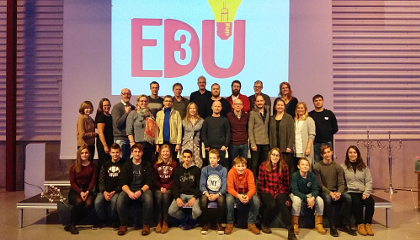 Farlingaye High School hosted the first partner school meeting of the two-year Erasmus+ 3D in Education Project following the week of training in Boras, Sweden in January. Visiting partner schools each brought two representatives and activities included a visit to BT research, Aldeburgh fish and chips, my studio and a practical workshop. 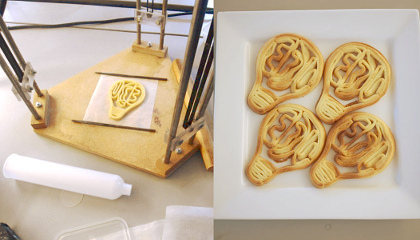 I had been asked to demonstrate 3D printing of food so we printed the project logo as biscuits. Ceramic Art London is the premier UK ceramic fair. 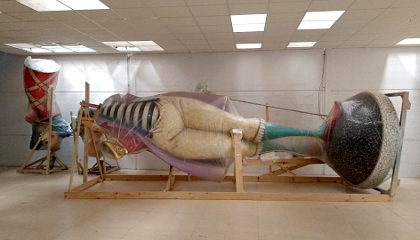 An annual event it is held around Easter in the main space of Central Saint Martins School of Art. I was asked to do a talk in the lecture series that is run over the three day even and to demonstrate ceramic 3D printing. I do not do demonstrations but I was happy to continue the student workshop that I had offered earlier in the year at CSM. 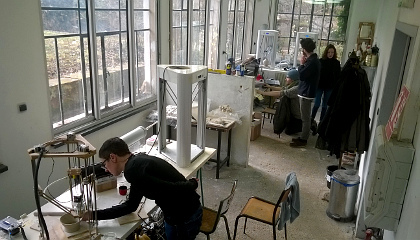 By continuing the workshop students could have access to my ceramic 3D print equipment that the Art School does not yet have and the Fair would get their demonstration. For the lecture I combined and edited two previous lectures and in this new form I felt it was well received. 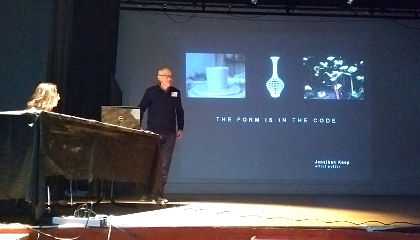 It combined my lecture on ceramic 3D printing that looks at different types of printing, the strengths and weaknesses and the users of ceramic printing, with my artist talk that covers how I got into printing, the work I have done and then other associated projects. 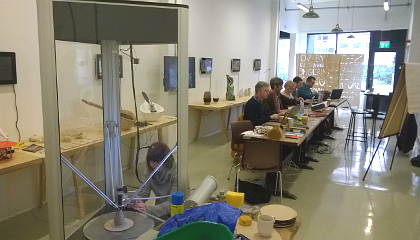 This ceramic 3D print workshop was in conjunction with the touring exhibition Future Artist-Makers in which I had work and was while the exhibition was at the FabLab in Limerick. The exhibition began its tour at the Nerve Visual Gallery in Derry, Northern Island and after Limerick it was to tour to UltraLab, Madrid. Workshop participant and active Limerick FabLab member Ivor O’Shea wrote about the workshop on his blog here. 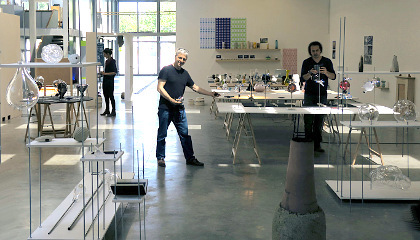 This mixed show of artists, designers and makers was curated around those using new and innovative digital craft techniques. 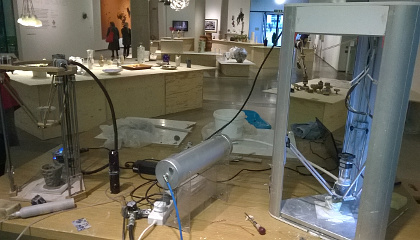 Work featured included metalwork, textiles, ceramics, jewellery and glass. The aim of the exhibition was to show how digital craft is becoming ever more advanced and with practitioners demonstrating an increased commitment to authenticity and originality. 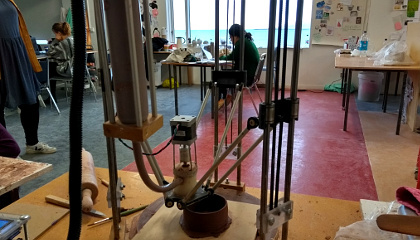 The Laboratory is a post diploma course open to students from across the school so some are design orientated, others more interested in making and others conceptually driven. This always makes for a fascinating range of approaches taken to thinking about combining clay, glass and new ways of working that include digital techniques. While teaching on this course and being back at the glass studio it was a chance for me to continue the series of work I had started a year ago where I 3D print ceramic moulds that are then glass blown into. Having built a larger printer last summer I was able to scale up the work that was very pleasing. The increased scale has a better bodily sense about it and the expression of the glass as a skin has more solidity while remaining fragile. 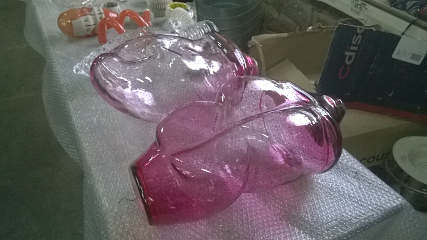 The skill of the CIAV glass blowers to judge the weight and thickness distribution of these large blown forms is most admirable. 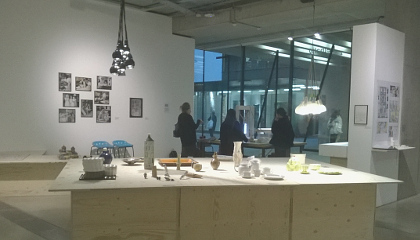 Celebrating the fact that Ceramics has been taught at Central Saint Martins School of Art for over 100 years the exhibition Craftsmanship Alone is Not Enough represented a mixing together of work by alumni and current staff and students. Celebrating this rich history the title of the exhibition was taken from words of pioneering teacher and founder of the course Dora Billington. 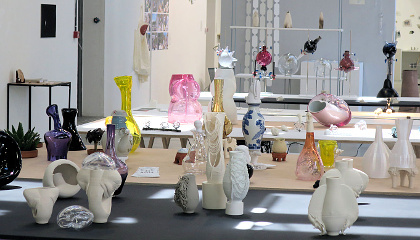 The organisers wanted the exhibition to reflect the embodied practice of working with ceramics so included an active studio space in the gallery. 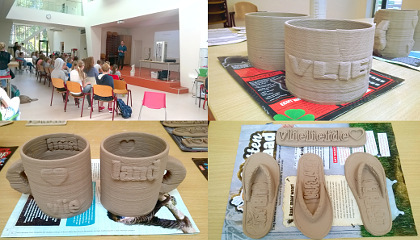 I was invited to do a ceramic 3D printing workshop with students from the ceramic course in the gallery. A personal added dimension to this was that my BA ceramics teacher back at Pietermaritzburg University in South Africa, Hilda Ditchburn had been a student of Dora Billingtons, so there was a lovely completeness to the event. Education 3D – formally the schools 3D Comenius project has started a new two year phase. Supported by the EU Erasmus+ fund the objectives of this project remain much the same as before and that is to look at how 3D printing and 3D thinking with be embedded into schools curriculum. There has been some change in participating schools with new schools joining from Norway, Finland, the Netherlands, the UK and Spain. They join two school remaining from the first two year phase, the lead school from Vlieland Island in the Netherlands and the Swedish school in Boras. This first meeting was back in Boras, a weeklong workshop held in the ideal surroundings of NAVED Science Centre. It was a chance for the new school to learn more about the project, for us all to get to know one another better, but the main aim was to offer a concentrated week of staff development. This included technical guidance on 3D computer modelling, 3D scanning and 3D printing but the overriding question constantly was how best to teach 3D think and how best to set lesson plans that make use of these skills across the curriculum and that are successful to teach with large student groups.